Technology is not yet the answer to frictionless cross-border trade, an agri-food conference has been told. While IT systems could help with duties collection, a senior economist said custom checks provided a "final line of control" before goods entered a market. Michael Haverty, of UK farm consultants Andersons, said checks were still required to ensure food and other products complied with regulations. He made the comments at the conference in Armagh. The Northern Ireland Affairs Committee at Westminster previously concluded a technical solution to the border would be possible. WQ&A: What is the Irish border backstop? Key members of Northern Ireland's agri-food industry are attending the event, which has been organised by the Irish Farmers' Journal and the Livestock and Meat Commission. Mr Haverty said technology could not yet determine whether a container was full of hormone-treated beef. 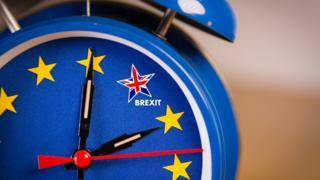 Delegates were told the current political dilemma had been caused by what was described as the "backstop trilemma". Mr Haverty said this was as the result of three mutually exclusive promises. These were that the UK would leave the customs union and the single market, that there would be no hard border on the island of Ireland, and that there would be no Irish Sea checks on produce moving between Great Britain and Northern Ireland. He said much effort had been made to find a way of reconciling these three promises. But as yet he said there was no sign of a "sweet spot" that did so and if such a solution existed it probably would have been found by now.